With our path to the north blocked by the vast Vatnajökull ice cap, to the south by the Atlantic Ocean and with a single road to choose from, we weren’t exactly embarrassed by our wealth of direction options for our second day in Iceland. It was either east or west. Although we were only 24 hours into our trip, we were already making plans for a return visit. Therefore, the binary choice confronting us didn’t seem so final. We’d get to the other one next time. As the majority of what we wanted to see lay to the west, including Geysir (the hot spring that gave its name to all of the world’s geysers) and the waterfall at Gullfoss, we decided to retrace our journey of the previous day. 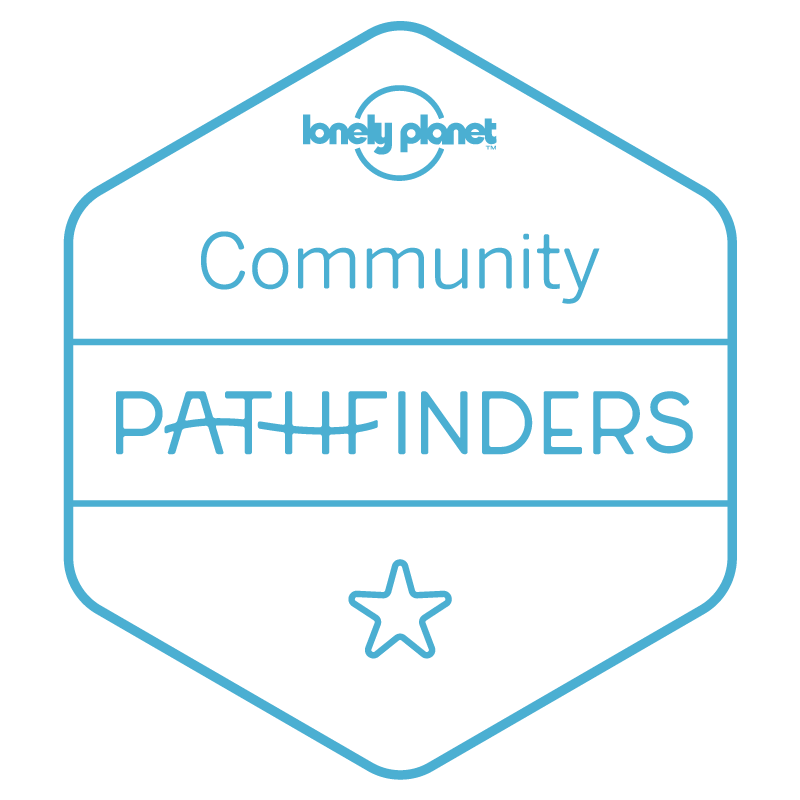 Today, again, beyond our “let’s go that way” decision, we had only a vague sense of an itinerary and absolutely no clue where we would end up that night. Heading back towards the west, and having travelled that same road the previous day, we thought we’d make good time. That theory lasted about ten minutes. Stopping for what we expected to be a final quick look at the beach and glacier lagoon at Jökulsárlón, we couldn’t quite believe what we were seeing. Since last evening, the whole icescape had changed. Casting aside all logic, the ice that had so enthralled us yesterday evening appeared to have been replaced by a whole new stunning collection. We would have been excused for thinking that, come nightfall, the icebergs simply return home to make way for the next shift. Once again the fake click of the digital photo shutter echoed repeatedly off of the ice as we skipped along the beach. Finally, throwing longing looks back over our shoulders, we said our farewells. A mere two hundred yards farther down the road, we turned into another parking area to take in a different angle of the glacier lagoon. Again, we were confronted by a scene that had completely changed since the day before. 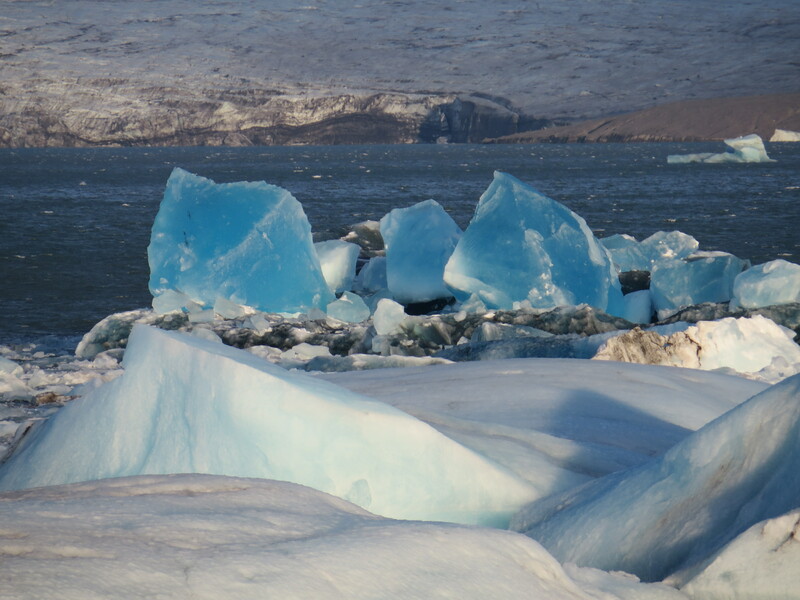 The huge, bright blue blocks of ice now sailing slowly in the middle of the lagoon simply could not have been there yesterday; we would have noticed them. the all-night partying it had enjoyed during the white nights of summer had finally taken its toll. In a few weeks, the sun will commence its annual battle with the horizon and plunge the country into months of nearly uninterrupted darkness. For now, the day-long sunset is a photographer’s dream; twilight, long shadows and wild nature combining to beautiful effect. Continuing on towards Vík, we noticed the mountains ahead were partially obscured by a greyish haze. Quickly discounting the possibility that it may be heat-related, we drove innocently on, barely noticing a blue road sign and, within it, what would soon prove to be a far more significant “40”, illuminated in red lights. We didn’t have to wait very long for either the cause of the mist or the relevance of the number to become apparent. Wind was barreling down from high above on the Vatnajökull ice cap, whipping up clouds of black volcanic ash on both sides of the raised road that bisected the immense, desolate and seemingly endless Skeiðarársandur delta. Like a NASCAR driver’s constant fight with a car determined to drift to the left, I tried to steer into the wind as waves of ash clouds pelted against the car, surely stripping all of the paint away from its right side. 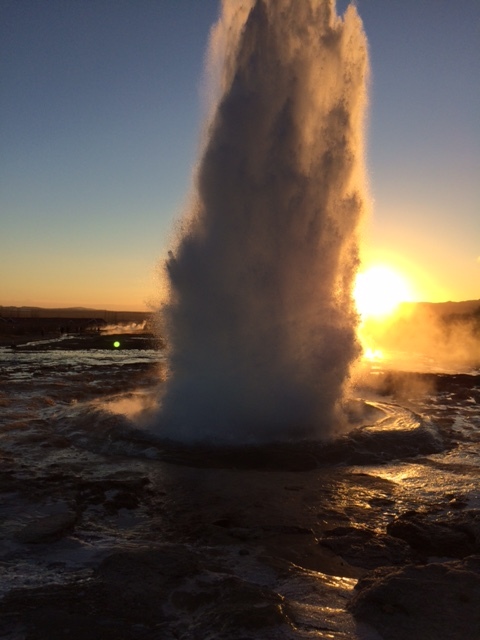 It was closing in on 4pm by the time we reached Geysir. As one of the components of Iceland’s Golden Circle (an unofficial collection of attractions within a day trip’s distance of Reykjavík) we anticipated the inevitable crowds of people that would bring an end to the virtually private exhibition of Icelandic scenery we had enjoyed since arriving. Yes, there were more people here than we’d previously seen in one place and I’m sure in the summer months (judging by the number of parking spaces) the crowds swell significantly but, for such a spectacle, the count of fellow visitors was refreshingly low. We had arrived at a near-perfect time of day. The sun was actually setting now (as opposed to the fake setting it had been doing all day) and provided a beautiful backdrop as we waited for the Strokkur geyser to erupt – which it does reliably every five minutes or so – sending water plumes soaring over 50 feet into the air, before vanishing again into its own massive sinkhole. Ten kilometres farther up the road lay the waterfall at Gullfoss. The sheer power of the falls is mesmerizing; so much so that we scarcely noticed as the biting wind transformed the cascading water into minute ice pellets that relentlessly pin-pricked at our faces. It was nearly 6pm by the time we left Gullfoss, and the question of tonight’s accommodation remained unresolved. 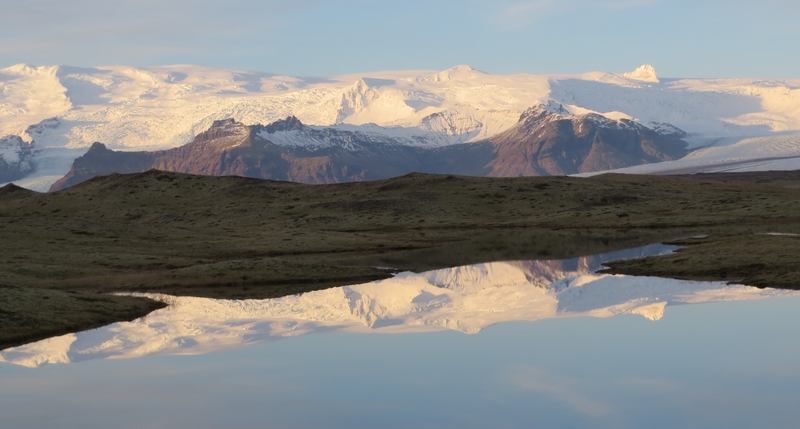 We knew we wanted to head towards the Snaefellsnes peninsula – the northern jaw of the Faxaflói Bay – but that was still a good 200 kilometres away. We marched on through the Þingvellir National Park; Iceland’s most important historical area, situated on the tectonic plate boundaries of the Mid-Atlantic Ridge and the site of the world’s first democratic parliament (the Alþing). By now, we had run out of the daylight necessary to spend the time the area demands, but added it to our ever-expanding list of things to see during our next visit. Turning north onto the Ring Road just above Reykjavík, we soon encountered the precipitous, 6 kilometre-long Hvalfjörður Tunnel. Plunging to depths of over 160 metres below sea level, the road descends at an alarming angle until, just when you’re beginning to think you’ll never again see daylight, it rises and twists its way to the surface. We stopped in Borgarnes to buy some snacks to sustain us for the remainder of the journey or – depending on what was still open when we finally stopped for the day – perhaps for the night. We decided on Stykkishólmur, the northern most point on the Snaefellsnes peninsula, as our destination. Even by Icelandic standards, route 54 north was eerily quiet. Had I bothered to count the number of cars that passed us on that dark 50 kilometre stretch of road, I doubt I would have needed more than my ten fingers. What the darkness did not reveal as we turned north on route 56 towards Stykkishólmur was the mountain range in our way. This only became apparent when a dusting of snow started to form by the side of the road, quickly followed by a helpful sign advising that snow chains should be used in 200 metres. 200 metres! Maybe there was an earlier sign warning of snow ahead. One of the perils of driving in a country where you can’t speak a word of the language is, unless it’s accompanied by a helpful, obvious symbol, you have no idea if the sign you’ve just passed was advising you to wear a seat belt or warning you of rabid wild dogs in the vicinity. 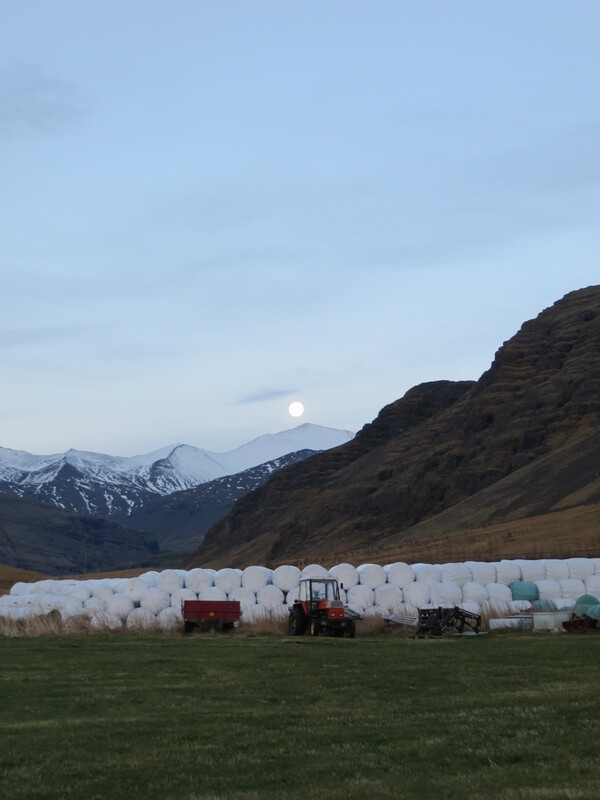 Fortunately, the snow didn’t ever amount to much and we were soon rolling into Stykkishólmur. 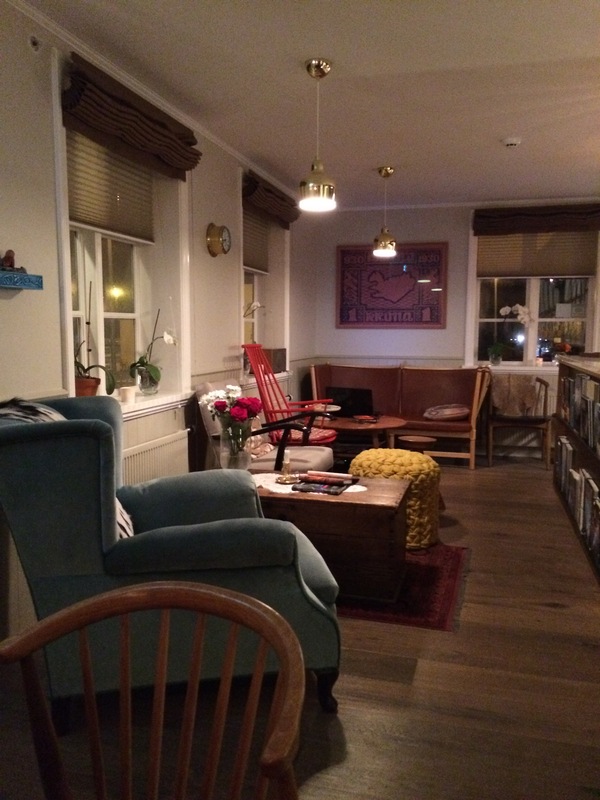 Our faithful Lonely Planet recommended the Hótel Egilsen near the harbour and, once again, the guide did not disappoint. We had covered close to 600 kilometres today and this hotel, supplemented by a take-away pizza and a couple of bottles of beer from my new favourite brewery (Einstök), combined for the perfect ending to the day. Yet, there was more to come. Shortly, a couple of our fellow guests returned to the hotel and mentioned that the northern lights were visible down by the harbour. Donning our multiple clothing layers in record time, we headed out, eyes fixed on the sky. Bright green ribbons of light were twirling erratically above us, as if controlled by a slightly uncoordinated celestial rhythmic gymnast. We stood transfixed, straining our necks as we searched the sky, oblivious to our numbing extremities; hoping the show would continue; wishing for an encore. When I first thought of visiting Iceland, the primary reason had always been to see the northern lights. Such had been the unexpected, enthralling beauty of the country, now that I’d witnessed them, the lights took their place as just one more incredible experience. And we had two days to add more. * I later discovered that what I thought meant 40 kilometres per hour, actually meant 40 metres per second; a discovery that also confirmed my suspicions that I wasn’t, in fact, 29 years old! What a great post and beautiful photos! I’ve always wanted to visit Iceland! Thanks for sharing. Thank you. I’m not sure it’s possible to take a bad photo in Iceland! Everyone should put Iceland near the top of their list of must-see places. It’s truly stunning. Great post and images. I was there in Sept. and can’t wait to go back. Unfortunately my husband does not like the idea of moving there! Thank you. I’m glad you liked the post. 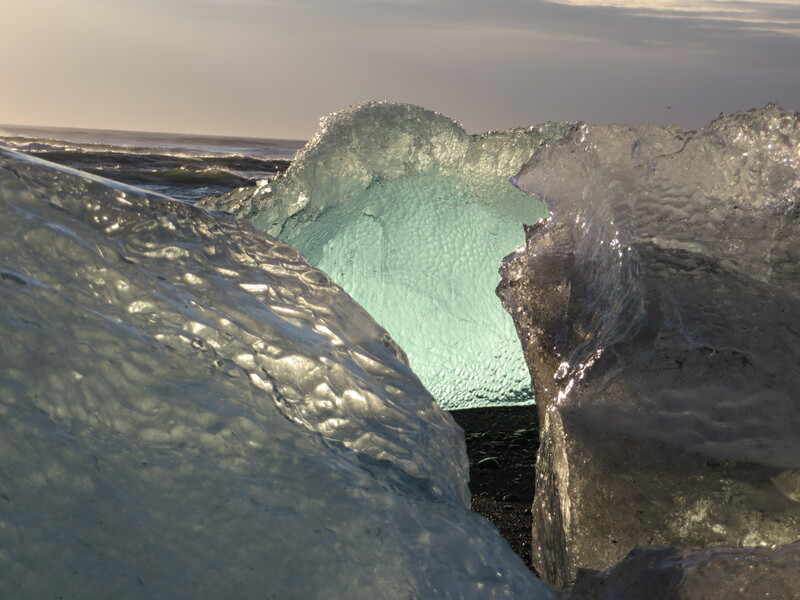 Iceland is a truly amazing place and we’re already thinking about our next trip. “Day three” will follow soon.